Well, I think that it is safe to say that 2012 was the year of online search startups. There were three significant ones that launched: 42 Floors, OfficeSpace.com, and The Square Foot. Knowing the Co-Founders of all three and understanding that the geographic focus will be different for some time, I believe that all three are going to have success in 2013. What will be interesting is when they start to compete in the same markets. So, that is my first prediction of 2013. 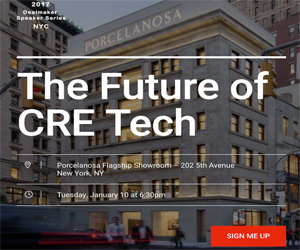 What CRE Tech niche will be ripe for disruption or improvement in 2013? Since online search was the talk of 2012, I believe 2013 will be the year of improvement in online search tools. More specifically, I believe we’ll see more advancement in automated listing tools. You’ve got three very smart statups in online search, and then a 4th Rofo, that has been in the space for 5 years now. All 4 will continue to grow their listings, but which one will find the exclusive “making it easy” for brokers to update their listing information. Costar and Xceligent have an army of call center people annoying the heck out of brokers to make sure their listing information is up-to-date. None of the 4 can afford an army of call center employees, so how do they automate the process? But not only automate, how do they keep the brokers engaged enough to rely on them to update their information without a call? 1 of the 4, if not all of them, will figure something out. So, in my opinion will see the most advancement in CRE Tech in how online search automates the listing updates from the brokers. What popular tech will pass its prime in 2013? Staying on the theme of online search, I think one of the larger companies, Xceligent, is going to be in decline in 2013 unless something drastically changes. Don’t get me wrong, I really, really hope that they succeed. One, I really like Doug Curry. Two, I do believe they have a tremendous opportunity to truly compete with Costar. However, the issue is with their marketing. I’ve heard time, and time again that they are a cheaper Costar. Now, this isn’t exactly what Xceligent is saying, but if you ask enough brokers this is the message that they’re hearing. A cheaper Costar doesn’t inspire brokers to jump ship to another service provider. I’ve used both CostarGo and eXplore Apps and I honestly think that eXplore has a slightly better user experience. But, you wouldn’t know it because they don’t market it in a way that makes me believe that without spending a significant amount of time using their services. So, unless Xceligent changes its marketing message, then I think 2013 will be the year of their decline. 42 Floors and others are taking the spotlight away from Xceligent, and it should be Xceligent’s game to lose with the resources and head start they currently have in place. But again, without the right marketing, I believe they’re losing the battle. What will be the most hyped product launch in 2013? I don’t know about product launches in 2013, but I do know that there are three CRE Tech companies that I’m really looking forward to seeing what they do in 2013. Honest Buildings, Compstak, and View the Space. All three are based out of New York and I know that at least Compstak and VTS had some success in 2012. Can they expand on that success, and what has Honest Buildings been up to? I love getting the emails from Compstak with the highlighted comps in NYC office space, and there is nothing more intriguing to a broker then comps. VTS has taken a concept that most brokers have thought of before and done something with it. Can’t wait to see what these guys do next year. My one wish for 2013? Very simple... For Duke Long to really tell us how he feels about CRE. Ha! My selfish wish is for every CRE broker in office, industrial and retail to sign up for Ten Eight’s new Version 2.0. Newer PostChris Clark: What does 2013 have in store for CRE?